Horses (and llamas, etc) show default name as "HorseChest"
To reproduce, tame a horse and ride it. Open your inventory. 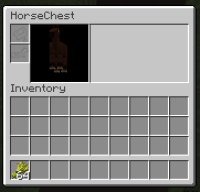 The text HorseChest will appear instead of the appropriate text.